First part of this series to Remove Google from Search is for Firefox users. The Search Bar is the text bar found in the top right corner of the Firefox window. 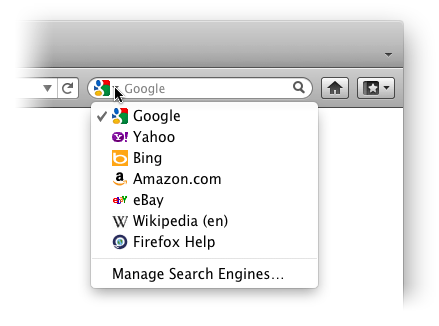 Firefox’s Search bar lets you perform search from any webpage open at that time, rather than having to visit websites of those search engines. When you enter a term in the Search bar, the indicated search engine is queried, and the search results are displayed in Firefox. In the Navigation toolbar, the Search bar is displayed in the far right corner. To use the search engine indicated in the Search bar, enter a term in the space provided, and press Return. The search results are displayed. Google is the default search engine in case of Firefox. In December 2001, Google reportedly agreed to pay just under $300 million per year to be the default choice in Mozilla’s Firefox browser, a huge jump from its previous arrangement, due to competing interest from both Yahoo and Microsoft. The name of the active search engine is listed in the Search bar and is identified by the small icon. To remove Google from search and change the active search engine, click the down arrow next to the search engine’s icon, and select a new search engine.